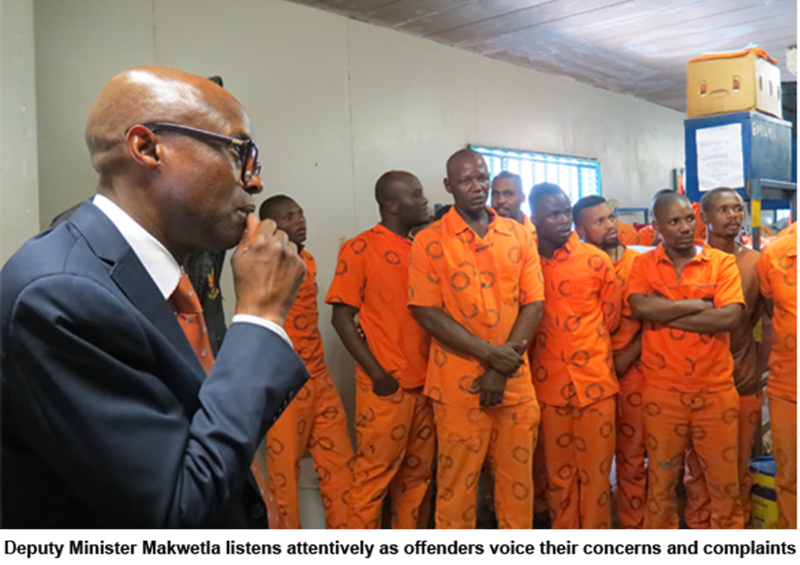 Deputy Minister Thabang Makwetla has been on a mission to visit correctional centres across the regions and gain an overview of the correctional centres’ daily operations as well as their challenges. On 24 January 2019, he visited Leeuwkop Management Area. Mr Makwetla was accompanied by Chief Security Officer, Lucky Mthethwa and Gauteng Regional Commissioner, Grace Molatedi. During an interaction with Leeuwkop’s executive, Deputy Minister Makwetla raised a concern on security issues, particularly access control at the main ports of entrance to the farm. He emphasised that security at Leeuwkop, including that of the periphery, is a concern and should not be compromised. “Security measures should be adhered to in this management area. This includes procedures of searching at the entry points. This is a security environment, it should not be a hazard,” he said. Makwetla also lamented that not enough offenders are participating in programmes offered by Spiritual Care services at most correctional centres. He said spirituality needs to be instilled in offenders, with the aim of inculcating morals and values. He said there should be joint efforts with relevant stakeholders to reach more offenders while they are still incarcerated. The Deputy Minister was taken on a tour to observe the periphery fences of the entire Management Area. The fencing is about 26 kilometres in length, and it has been identified as one of the areas that needs refurbishment. Leeuwkop has a 871 hectares farm and its four centres accommodate about 4 483 offenders, which are 37.22% overcrowded. Altogether 869 officials are employed at Leeuwkop. 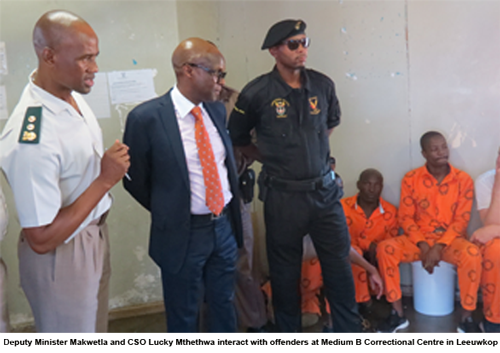 The Deputy Minister also interacted with offenders at Medium B Correctional Centre. He addressed the offenders in their respective cells and assured them of the government’s commitment to their rehabilitation, and to reintegrate them back into their communities.